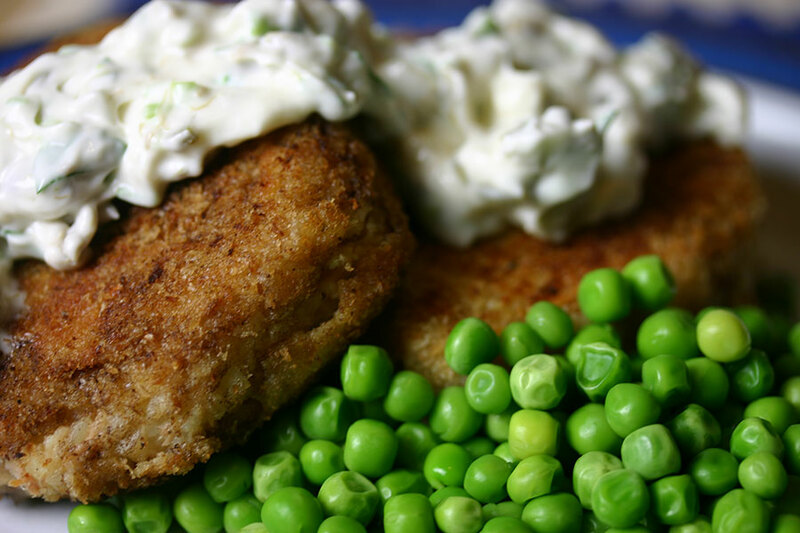 Fishcakes are a great store cupboard supper – quick to prepare using ingredients we nearly always have on hand. The addition of homemade tartare sauce makes it that bit more special, for those of us who like that sort of thing. For those who don’t, they are also nice with a wedge of lemon on the side. This recipe works equally well with tinned salmon. While fishcakes are one way to use up leftover mashed potato, I prefer to cook the potatoes fresh and mash them without butter or milk. If I’m using yesterday’s mash, I leave out the butter. Cooked the potato in salted water until tender. Drain, allow them to cool and dry out for a few minutes, then mash and allow to cool completely. In a large mixing bowl, add the mashed potato, tuna, butter, dill, chilli powder and lemon zest. Add a tablespoon of beaten egg, and mix under thoroughly combined. Season generously with salt and pepper. Form the mixture into eight patties, arrange on a plate lined with clingfilm and chill for half an hour. While the mixture is chilling, make the tartare sauce by mixing together the mayonnaise, capers, pickle, vinegar, onion, parsley, salt and pepper. Arrange the flour, beaten egg, and breadcrumbs in three separate bowls. Dredge each fishcake with flour, then dip in beaten egg and coat with breadcrumbs. In a large frying pan, melt the butter and oil together over medium heat. Fry the fishcakes until golden on both sides and heated through. Serve with tartare sauce. Earned approval of all at dinner last night. Glad to hear it! Did you use tuna or salmon?